Upper Brice is one of my all-time favorite Willamette Valley creeks. 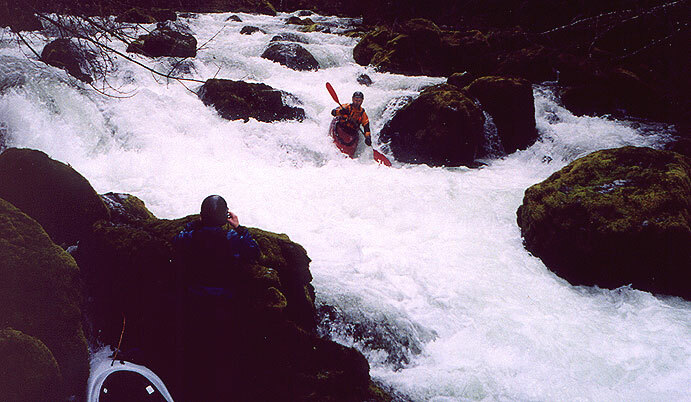 This run defines continuous whitewater; when the rain is falling hard and the rapids start to push, this creek is transformed into a whitewater playground that has few peers in the state. That said, you must have plenty of water in this section in order to enjoy it. The boulders are small but plentiful on this run, so when the flows get low I imagine this run would be pretty miserable. The paddler's gauge at the bridge (pictured at the end of this report) is where locals determine the runnability of this section. 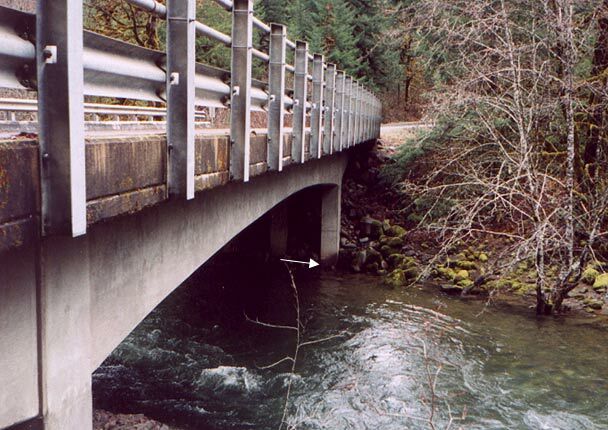 Generally speaking a foot on the bridge gauge is probably the minimum flow for the upper (but fine for the lower) and over two feet is considered high for the upper and challenging on the lower. The photos on this report were taken at 1.5 feet on the bridge gauge, an optimal medium flow for Upper Brice. In February 2002 I teamed up with Gabe Flock and Steve Stuckmeyer to run Upper Brice. The night before our trip an inch of rain fell, bringing the level up six inches to 1.5 feet, which is well within the 'fun' range. After a brief discussion we decided to put in above Parker Falls and run on down through the first gorge. This uppermost put-in isn't used that often because of the log hazards in uppermost gorge, but we decided check out the gorge and see if the wood situation had improved. It hadn't, but I'll get to that in a second. When we got to the put in we hauled our boats down through the snow to the top of Parker Falls. I was the only one who had run the falls before, so Steve and Gabe did a little scouting while I tried to figure out where to shoot photos and set up safety. Finally I determined that the other side of the creek offered the best angle for the rope and camera, so I ran the falls first. If you have never put-in above Parker Falls before, this is one heck of a warm-up! Basically you peel out of the eddy, run down through a narrow, pushy class three drop, then tear around a ninety degree turn and charge down into the middle of the falls, dropping about fifteen feet into the gut of a big hole! 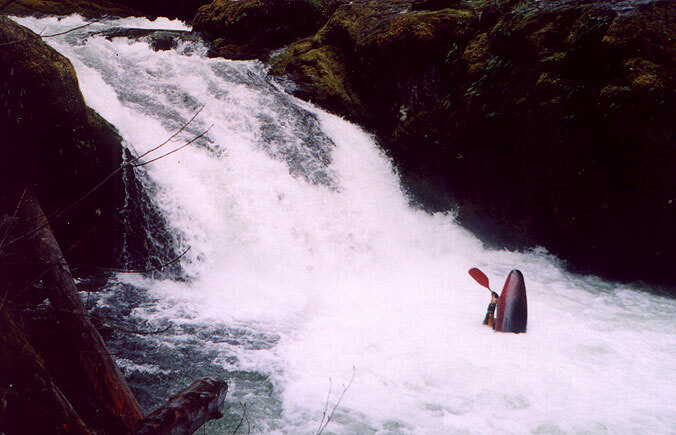 Everyone disappears into the foam at the base of the falls for varying lengths of time, surfacing abruptly downstream in a stern squirt or upside down... It's a great way to start the day, and may just be the finest put-in I have ever experienced. Steve Stuckmeyer surfaces below Parker Falls. The bottom of the class III rapid leading to the lip of the falls is just visible upstream. 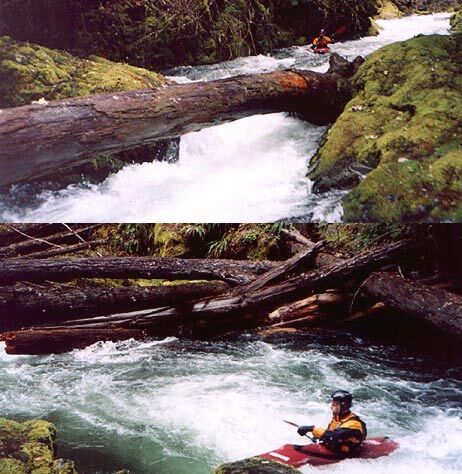 Both of the photos below were taken from the same spot, showing Steve approaching the limbo move and then hitting the eddy on the river-left to avoid the logjam twenty feet downstream. Just below the first logjam is a blind drop with two more logs blocking the outflow; we portaged the first and managed to sneak past the second and then it was kickoff time! The section between the upper gorge and the first bridge is very steep, well over 200 fpm, which adds up to one big rapid with very few eddies in the first half mile or so. We didn't encounter any wood in this section, which is fortunate because it would have been difficult to stop at this flow. The first named rapid below Parker Falls is 'Bubble Trouble', a rather appropriately named ledge that rumbles down into a huge, foamy hole. We all ran this one down the right side with momentum. Steve Stuckmeyer approaches 'Bubble Trouble.' 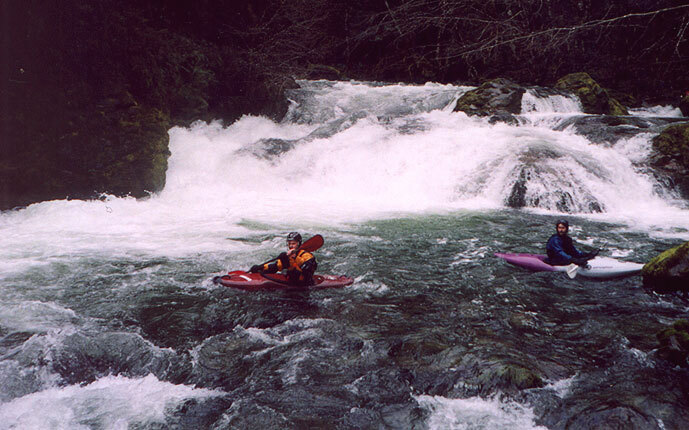 The rapid visible in the background is pretty typical rapids on this creek, which tend to be steep, bouldery, and clean. Just downstream from Bubble Trouble (a great name for a rapid, I might add) is The Snake. This drop has a very dangerous pin spot against the river left wall, so paddlers can either portage along the road or run the right side. The trick here is to stay upright and in control through as you round the corner and approach the slot in the middle of the creek (pictured below). Gabe flock rides the pillow on the first part of The Snake on Upper Brice. Below the Snake the action is fast and furious with very few eddies. Soon we reached the next named drop, Orthodontist's Nightmare. 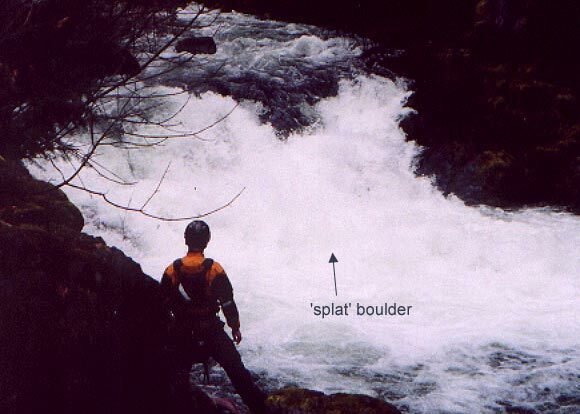 This highly technical rapid is pictured in Soggy Sneakers (the soggy pic was taken at much lower flows than the photo on this site) and features a boulder at the bottom of the drop that juts out at face level; you get the picture. Steve Stuckmeyer drops into the final slot at Orthodontist's Nightmare. 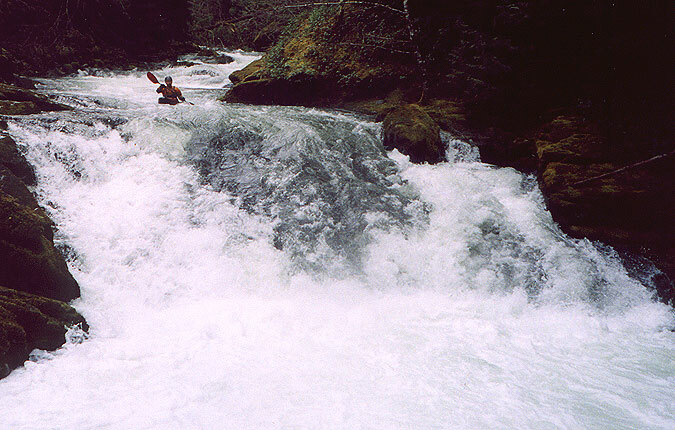 Just downstream is Lemans, one of the most consequential rapids on Upper Brice. The lead-in drop just above Lemans is also deceptively dangerous; fast, powerful water leads to a large boulder which blocks the current in the middle of the creek. There are no eddies and the water drops over a horizon line on either side of the boulder into a small pool above Lemans. The left side of this drop plunges onto a nasty-looking boulder which has claimed several paddles, while the right plunges cleanly into a hole. It is very likely when you run this creek you will end up boat-scouting this drop, so remember: Stay right below Orthodonist's Nightmare! Just below this drop is a small pool with an eddy above Lemans on the left. Just below this eddy the creek is choked by several large boulders, which force the flow into a narrow, turbulent, blind passage. Just below the entrance the current piles into a large boulder, which again divides the flow. All of the water on the left side goes into a killer boulder sieve which isn't visible from above (take this move seriously!) while all of the water on the right side rushes into a dead-end boulder fence. The first time ran this drop I boat-scouted it in a broken boat that was slowly filling with water; I almost ended up in the sieve because my boat was so heavy I almost couldn't make the turn turn at the top. Be on your guard here! The trick with Lemans is to cut right to avoid the sieve and then charge left around the large boulder to avoid getting munched by the boulder fence. This high-speed mandatory s-turn is where the rapid gets it's name; you'll see what I mean when you get there. Steve Stuckmeyer comes out of Lemans. The entrance of the drop is indicated, and if you look carefully you can see the right side of the boulder all of the water piles into at the top of the drop (to Steve's immediate left). 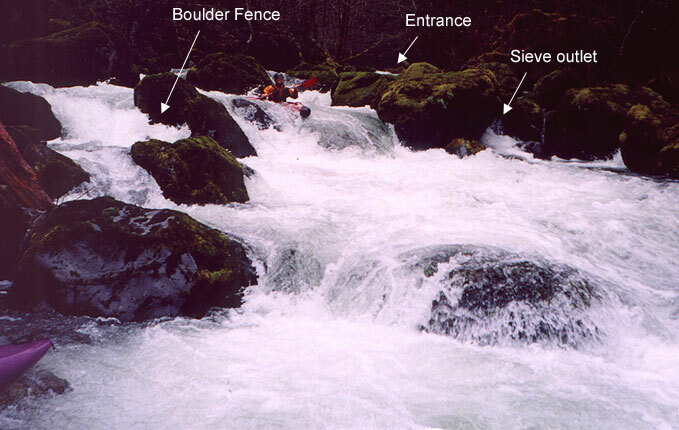 If you miss the move and go left you'll end up under the boulders on the river-left side (sieve outlet), and if you miss the last turn you'll end up in the dead-end boulder fence indicated on the river-right. Personally, I prefer the fence to the sieve, so erring too far right rather than left seems like the best plan on this one. Below Lemans is the last named rapids on Upper Brice: Hop, Skip, and Splat. Be very careful above this rapid; at flows above a 1.5 feet it can be hard to stop above it! At Hop, Skip, Splat the creek roars over a steep ledge that looks great, except for the fact that 90% of the water powers into a large, submerged boulder with terrific force. I have never seen anyone run this drop, but I have heard stories of epic thrashings here. 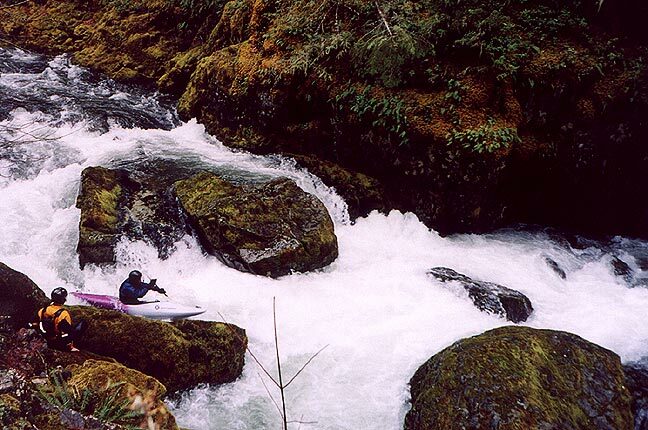 The photo shown below was taken from the road, so this rapid is easy to scout on the way up. Prudent paddlers will scout eddy possibilities above this drop as well, especially at higher flows. Gabe and Steve get ready to take-out below Cheese-Grater on Lower Brice. This drop slides into a big hole, so keep your boat straight! A friend of mine was stuck in the hole below this drop for ten minutes at high water one time, so be sure and hit it with everything you've got! Flows: The paddler's gauge is pictured below, on the bridge 1.5 miles downstream from Cedar Creek Campground. (The take-out for lower Brice). The gauge is on the river-left side, painted in white as indicated by the arrow below. Flows on this creek are notoriously difficult to predict, so here are a few links to help you get there when the water is right. First of all, Dorena Reservoir inflow should be between 1200 & 3000 CFS. This number can be higher in the winter, lower during spring snowmelt season. An inflow of ~2200 cfs usually seems to mean optimal flows. It's also a good idea to look at the rainfall gauge at either Dorena Reservoir or Sugarloaf mountain. Unless its been raining regularly, or the weather is hot and snow is melting, you probably need an inch of rain in the last 24 hours. The paddlers gauge is on the downstream, river-left, pillar of the bridge you cross ~1.5 miles downstream of the take-out at Cedar Creek Campground (pictured above). (This is also the start of the Brice Creek Trail, with a large parking area alongside the road.) The gauge should be between 0 and 2 feet; Zero is rather easy and very shallow in many places. 1 to 1.5 feet is optimal for running Brice top to bottom. Below 1 foot the upper section is usually too low, and above 1.5 feet the lower section develops some rather nasty hydraulics (The 'Drowning Machines' described in the Lower Brice report.). If that gauge is above two feet most people will go elsewhere (Layng Creek, Row River, or Brice Creek below Cedar Creek) for big water class III-IV runs.